Meet Us at Marine Week 2011! To view the web version of this email click here. Message Board for "What's After Bootcamp?" New to the Web Site? NOTE: When communicating online, your Marine's privacy is as important as Operational Security. Please respect YOUR Marine's privacy! Tip: While in our store, check in your Marine's unit store for more homecoming shirts! Show your support of our Marines and their families! Participate in one of the Marine Parents outreach programs today! Our Marines need YOU! Covers PTSD and Combat Recovery; Must-Reads for military families! "Red Friday...It's a Military Thing"
Show your support for all military branches! If this is the first edition of the MarineParents.com Newsletter you have received, WELCOME! If you are a returning reader we are glad you have joined us. In this newsletter, learn how you can meet up with Marine Parents at Marine Week 2011 in St. Louis, Missouri. The official Marine Week event schedule is not yet posted, but we are arranging some get-togethers near the event site for families. Also, if you haven't read the recent Department of Defense announcement about clarification on Purple Heart Standards, see a link to the news release below. As always, thank you for continuing to support Marine Parents and our troops! Come See Us at Marine Week 2011! Get ready for Marine Week 2011! Marine Week will be held in St. Louis this year from June 20 to June 26. According to the official page for Marine Week 2011, "The week-long celebration will showcase the unique characteristics of America's Corps through more than two dozen events where attendees can watch combat demonstrations; climb aboard aircraft and ground equipment, to include helicopters, the V-22 Osprey and amphibious vehicles; and participate in community service projects alongside Marines." Click here to learn more about the event and meeting up with us! On April 28 the Department of Defense (DoD) released a news article regarding the standards upon which a service member can receive a Purple Heart Medal for a traumatic brain injury. Purple Heart awards have long been presented in the event of a brain or other concussive injury caused by enemy action or in action against the enemy, but there was uncertainty about presenting an award when the injury was not treated by a medical officer. On April 10, 2011, the East Coast Purple Heart Hero Support™ volunteers served burritos from California Tortilla to Wounded Warriors and their families at the National Naval Medical Center at Bethesda, Maryland. The Marines were in for several other surprises that night. "Words could not describe the sense of pride I felt when [my son] graduated from MCRD SD last month. When he walked into my sister's house in his Dress Blues, he saluted my father who could not help but shed a tear. A moment that our family will never forget." Photo (from left): 1st Lt. Cleon L. Fellows (Alpha Co. 1/1 Korean War Veteran '51-53), his grandson Pfc. [name omitted] (MCT BN India Co. 2nd PLT) and Cpl. Steven M. Fellows (3/1 Kilo Co. '82-88). All three generations' units were out of Camp Pendleton. Everyone is gearing up for marathon season as the weather warms up...are you signed up for Team Marine Parents™? The outreach program encourages run/walk event participants to run on behalf of Marine Parents and collect donations through sponsorships. 1. Round up a team or sign up as an individual, and establish a fundraising goal in support of The Care Package Project™, Purple Heart Hero Support™ or Operation PAL™. 2. We'll put your team's picture, profile and fundraising goal online. 3. Collect sponsors/donations until your event date. 4. Put on your walking shoes! Check out a few teams who have already gotten started! "My name is Brian Wilkinson and I am running the 2011 Marine Corps Marathon to raise funds for Purple Heart Hero Support™ a wonderful charity that assists our wounded heroes. My wife Katie encouraged me to sign up and run for Team Marine Parents™ in 2011. Our son John is a Marine deployed with the 1/3 Lava Dogs and will be serving his 2nd tour of duty in Helmand province Afghanistan from April 2011." Click here to help Brian reach his goal! "I am a former Marine (1980-1984) and my son Eric is an OIF Marine Corps Veteran. He lives with invisible disabilities daily (PTSD, TBI, Hearing Loss and some back pain) but he is and will always be my hero. The Purple Heart families have gone through so much. Supporting these brave Marines and their families is the least I can do to say thank you. I am honored to run the full 26.2 miles at the Marine Corps Marathon on their behalf and to raise as much money as I can to help out. I thank you for your support." Click here to help Sharon reach her goal! For more information on joining the team visit www.TeamMarineParents.com. This free kit includes everything you need to help us spread the word about Marine Parents and the support it can offer families. 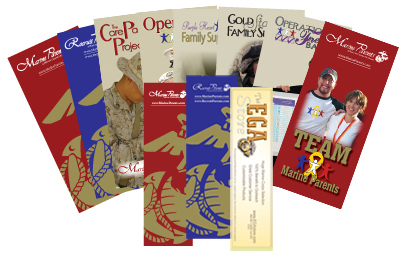 In addition to brochures, we include a coupon for The EGA Store, an EGA Store coaster and a Marine Parents lapel pin as a token of our appreciation. We hope that you'll distribute these brochures to your friends, family and local recruiting office to help spread awareness. Thank you for your support! 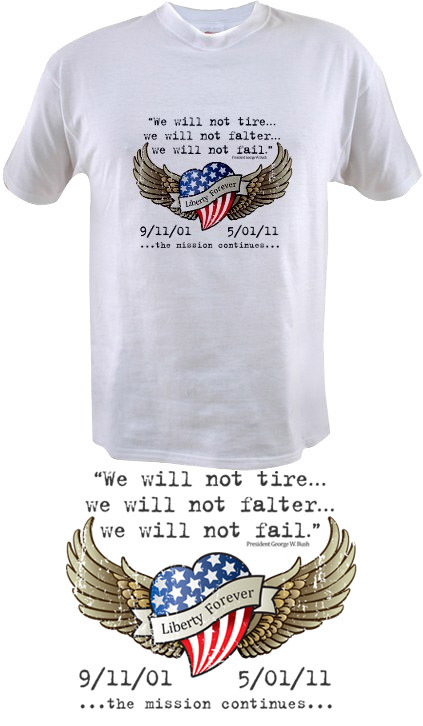 Celebrate our recent May 1st victory with these tasteful patriotic t-shirts. 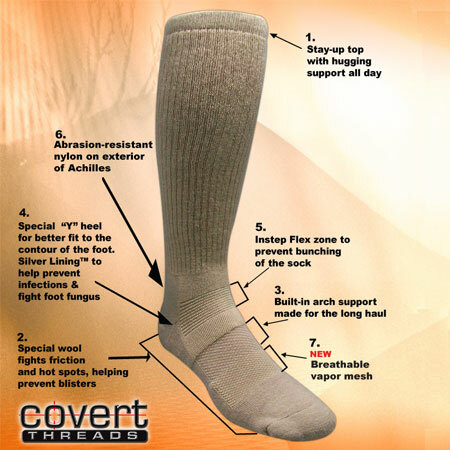 We offer three different designs. We hope this week's edition of our email newsletter has been useful for you and your family. If there are topics you would like us to address, or if you have other suggestions for the newsletter, please contact us. The banner used at the top of this newsletter is an April 2011 USMC photo by Cpl. Reece E. Lodder of Lance Cpl. Beau Bechtel, a rifleman with India Company, 3rd Battalion, 3rd Marine Regiment, and fellow squad members patroling down a dusty path during counter-improvised explosive device training at Marine Corps Training Area Bellows, Hawaii, April 26, 2011. Click here to read additional credits. MarineParents.com, Inc. is a 501(c)(3) public charity. MarineParents.com, Inc. was founded in January, 2003 in response to parents' needs to find information and to have a Place to Connect & Share™ with one another during deployments. Our free online services and connections have expanded to support and educate Marine moms & dads, spouses, families and friends. We've helped over 130,000 Marine and recruit families during bootcamp, training, active duty and deployments. We've shipped thousands of care packages overseas to our Marines in Iraq and Afghanistan, sent thousands of prayers and letters to injured Marines and served hundreds of meals to Wounded Warriors and their families on both the East and West coasts. You've found a Place to Connect & Share™. Neither the United States Marine Corps nor any other component of the Department of Defense has approved, endorsed, or authorized this service.